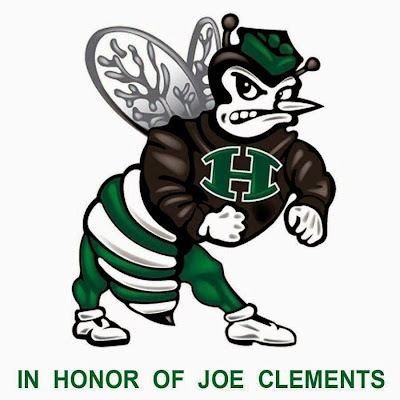 On a recent Saturday afternoon, generations of Hornets gathered together at Huntsville High School to say goodbye to our beloved Coach Joe Clements. Family, friends, coaches, board members to kindergarteners and all manner of Hornets in between came to pay their respects to, reminisce about and acknowledge the remarkable influence Coach had on thousands of Hornets, living both near and far. The coaching staff was one of the first groups to stand, and eventually everyone rose to their feet as Mrs. Hope Robinson acknowledged Coach has influenced all of those who have been influenced by Huntsville ISD. Reverend Reagan Cooksey officiated the service, which was held in the Paul Bohan Gymnasium of Huntsville High School. As Coach Clements' son Steve spoke, he included a Herman Melville quote that seemed specifically written for his dad, "We cannot live only for ourselves. A thousand fibers connect us with our fellow men..." The folks in attendance at the service were just a small portion of the folks connected to Coach Clements. Mrs. Nadine Pharries of the Technology Department of Huntsville ISD shared Coach Clements' obituary. And, in the family's sadness in their dad's passing, Steve Clements asked those in attendance to pray for Christain Champine, Malik Brown and their families. Christain and Malik, both Huntsville Hornet football players and members of the Class of 2014, were involved in a car accident in which Christain lost his life. We are all part of the Hornet Family. Former Huntsville High Coach Jack Armstead was moving, but also funny and touching. He included the musical theme from "Patton," which the Hornets often played under Coach Clements. Kooter Roberson spoke of Coach Clements' competitive spirit, but also his compassion and respect for his opponents. Coach never wanted to beat a team so badly that the "kids on the other side of the ball" would lose their love of the game. Judge Jerry Sandel accompanied Coach Clements' daughter Jill in a rendition of "Jesus Loves Me." KBTX-TV and The Huntsville Item covered the service. At the conclusion of the funeral service, the attendees were invited to the commons area of Huntsville High School. The reception mood was lighter, and people started swapping stories about Coach, catching up with each other and reminiscing about some very, very good times. Just some of the pictures and mementos that were brought by family and friends. 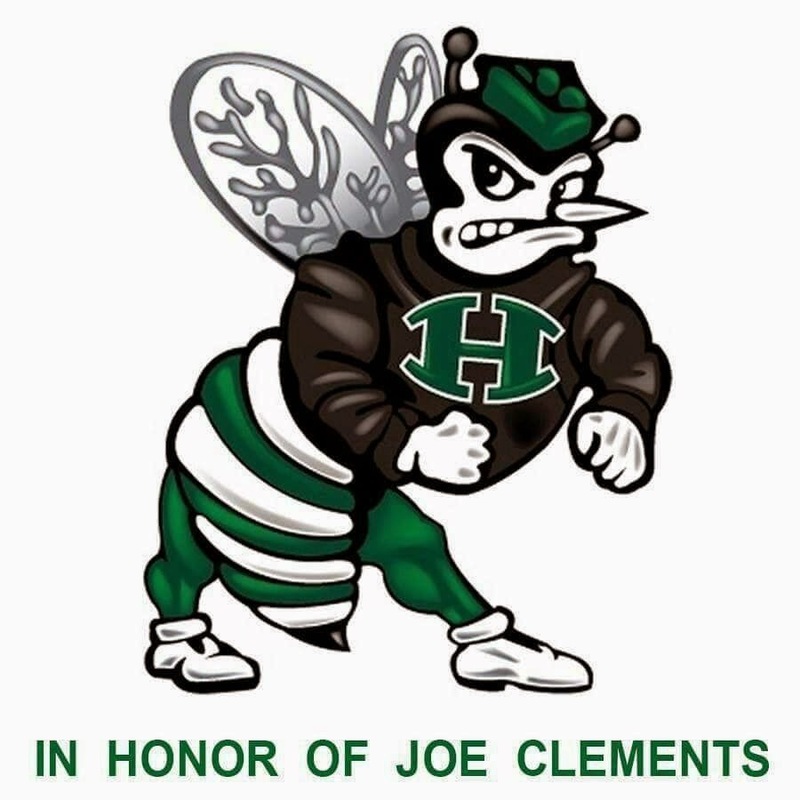 Coach Joe Clements is survived by his wife and love of his life, Jill Clements and their children and families, Little Jill Clements, Jay Clements, Steve Clements and Chuck Clements. You can read Coach Clements obituary by visiting The Huntsville Item's page here. He will be missed, and his influence and accomplishments will last forever. Thank you, Coach! Connie Mathis, "Tootie" and John Nelson, a former player for Coach Clements. Former Huntsville High School Principal Mrs. Ann Froelich with Mrs. Nadine Pharries. Huntsville High School Head Football Coach Rodney Southern watches highlights. gave to him when he arrived in the District last year. Coach Southern was among the folks who wanted to see all of the memorabilia. Old friends catching up, with Coach Clements as their connection. Mr. Doug Smith and Mr. Brian Adams. Coach Clements legacy on and off the field. Same photo as above, plus a photo bomb by Jill! "Lil' Jill in a light moment at the reception. Huntsville ISD School Board Member Sam Moak shares a laugh. Some of the Class of 1992! Lower: Stacie Phillips, Hope Robinson and Heather Franer. A lot of highlights on this highlight reel- and these don't count the highlights OFF the field. Jack Armstead, Former Head Coach of HHS & friend. Rev. Reagan Cooksey, Pastor of Northside Baptist Church & Coach Jason Elliott at the reception. John Nelson and Steve Clements at the reception. Mrs. Nadine Pharries worked with the family to bring the service & reception here to the school. Coach Clements was first a boss, then a mentor and eventually a close family friend to Mrs. Pharries. On the Friday before the service, we made our way down to football practice. These kids may not be too familiar with Coach Clements, but he helped pave the way for them to be here. The Oilers have Luv ya Blue, and the Hornets have Luv ya Green! A Yearbook from 1953- that championship year! When you play it the right way, football is more than a game. profiles to this photo in honor of Coach Clements passing.